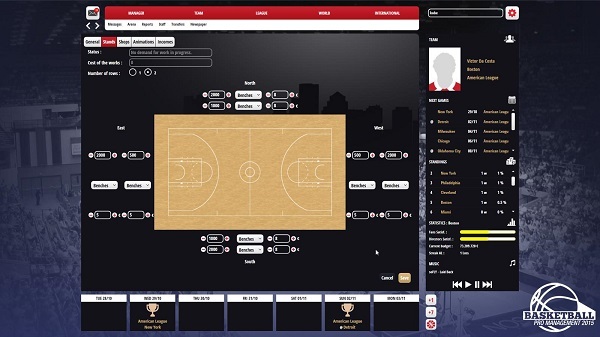 Basketball Pro Management 2015 simulator developed by Cyanide Studios is another edition of Pro Basketball management series. Having watched a fair bit of basketball over the years and played a lot of the NBA2K series I felt confident at trying my hand at a basketball simulator. When you first launch the game you are given a number of menu options to get you started and one of those options are ‘Basketball Rules’, so if you’re just a casual basketball fan or a total beginner it is probably a good idea to brush up on the rules. The rules are separated into Basic and advanced, there are also sections on Offensive and Defensive tactics. It’s quite handy to have one area where you can learn more about Basketball and learn how many fouls you are allowed per quarter and different defensive tactics. Starting a new game you can choose from existing teams or a new team, male or female leagues and the size of the database. There are a number of similarities to Football Manager in setting up and choosing the type of league you want to manage. The teams and players are all fake however since I guess they were not able to buy the licenses from the NBA, which takes away a certain level of realism when Chris Pael ( aka Chris Paul) or Lebron Jamas (aka Lebron James) are in your team. Once you have created your manager profile and picked the team to manage you are all set. The interface is fairly simple, although it did take me a while to find the button to continue which is located as a basketball icon at the bottom of the screen which simulates until you press spacebar, with a +1 to simulate 1 day ahead and +7 to simulate a week ahead, which in my opinion is a strange way to do it usually a continue button gets you from one event to another. You have your e-mail icon on the top left which will take you to your inbox that will have information on rumours, signatures, schedules, injuries, reports and administrate information. At the top of the screen you have Manager, Team, League, World and International as the games main menu options. Manager will allow you to look at your messages, staff, arena etc. You really do have control of everything even the price of how much you want to charge for a soda or a beer during games and how many bars and shops you will allow open in your arena. You can even decide what type of cheerleader and mascot performance you want to provide as entertainment, you can choose from Amateur, Professional and Exceptional with exceptional costing your franchise a lot more money. What does that have to do with basketball? Well watch a game of NBA and you will see just how important entertaining the crowd is to NBA teams. Picking a team and choosing your tactics was a bit difficult for me since I don’t really understand basketball tactics, even with the help of the basketball rules section mentioned earlier. I did find myself fumbling my way through trying to pick my team but luckily the developers have the beginners in mind when they created this game and you can click on a very helpful Assistant button which will ask your Assistant to pick your tactics for you. My first game was a friendly with my team Lob Angeles (LA clippers) and Cleveland (Cleveland Cavs). You can choose from a 2D court or a 3D court which also has some commentary underneath the 2D/3D court. To start the game you have to click the play button on the top right hand side. Since basketball can be a long game you can speed the game up or just skip to the end of the quarter and even to the end of the game. The 2D pitch reminds me a lot of the Football Manager 2D pitch before they introduced 3D pitches. Not sure 2D really works as well with Basketball since you’re looking top down and judging the height of the ball can be difficult, however I was very impressed with the 3D pitch. The visuals and animations are very basic and simple but for a simulation are quite good. 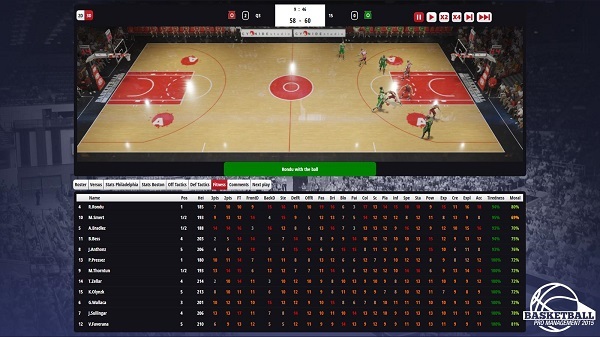 During the game you are able to ask for timeouts where you can motivate your team with several menu options and are given instant feedback on how your players have taken to your team talks. Basketball is all about statistics and there are a number of tabs which give you all the statistics you need to keep an eye on your players. You can even adjust your offensive and defensive tactics on the go while watching the game and instruct your players what you want the next play to be. It’s a nice interactive way of playing a simulation when you can tell your player to either go for a 3 pointer, 2 points, shoot from the paint or drive to the hole. It was quite satisfying telling Chris Pael to go for a 3 pointer and watch him sink it in Lebron Jamas face! I did attempt to work out the transfer system but gave up when I just couldn’t free up enough space in my roster to do a trade. It does seem fairly complicated for a beginner to pick up but someone with a good background knowledge of the game should be able to pick it up. You can manage training yourself or get your assistant to take on training for you, since I wasn’t sure how to do it manually I got my trusty assistant to take on the burden. 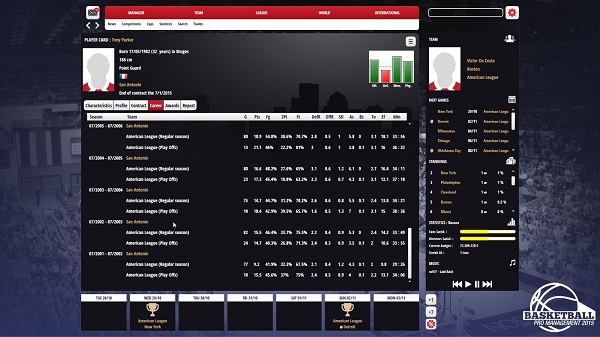 Finances are also an important part of a basketball manager’s role and in the finance section you can see just how much your superstars are costing in salaries each year and what your budget is for the rest of the season. Basketball Simulator 2015 is a bit rough round the edges. It reminds me a lot of the very first Football Manager games before they built more functionality and user friendliness into them. For a basketball beginner if you are patient enough you will pick up a lot more about the sport especially the inner workings of a franchise. For the die-hard basketball fans this is a great game to take control of your own franchise and see if you can lead your team to a championship. It needs a bit more work in the user friendliness department, for example one button for moving onto the next simulation phase like a continue button would be helpful. An in game tutorial would be extremely helpful for encouraging new players to try their hand at this game, the game does provide online help which you can access within the game. Although it will be expensive if it is possible getting the NBA license for real team names and players would help add more realism into the game. This game isn’t an All-Star yet but it has the potential.